For many birders a highlight of birding the southeastern United States, maybe even the definitive birding experience of the region, is taking in the great numbers and diversity of long-legged wading birds. The epicenter of large, charismatic, and often photogenic, fish-eating birds is in Florida, at places like Everglades National Park and Ding Darling National Wildlife Refuge, the only site in the park system that could convincingly be named for an exotic dancer. Florida isn’t just notable from a continental perspective; its waders are rightly world-renowned and the birding is nothing short of spectacular. But would you believe that that sort of amazing wader show is increasingly common up the coast as well? Call it climate change, call it habitat restoration (in truth, it’s probably a little of both), but as far north as South Carolina you can find much of the same diversity in impressive concentrations, without the proximity to saccharine, nausea-inducing theme parks (though I’m told that proximity is actually a selling point for some. Who knew?). 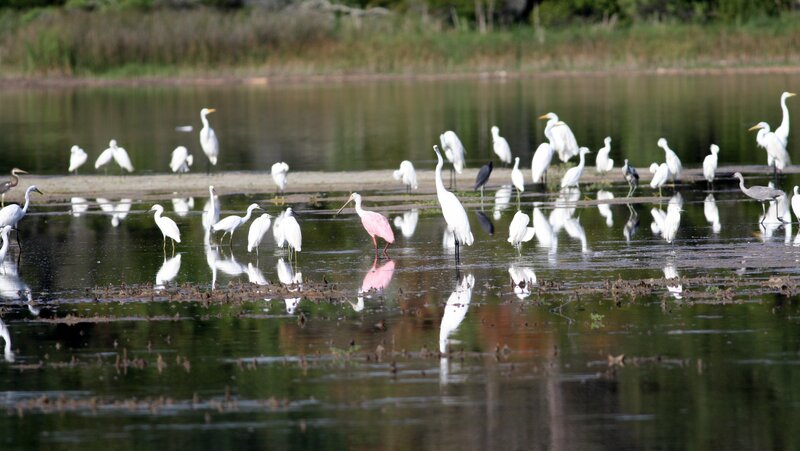 I discovered this surprising water bird bonanza at Huntington Beach State Park in Georgetown County, South Carolina. I’d been familiar with the occasional post-breeding wanderings of great birds like Wood Storks and Roseate Spoonbills into the southern part of my own state, but to be in an area where both are practically guaranteed and to not be assaulted by Shamu and Donald Duck to see them? Where do I sign up? 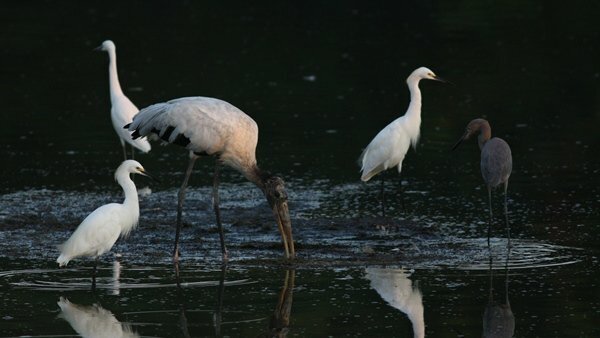 I mentioned the great gathering of Wood Storks in my last installment, but I didn’t mention the fact that you couldn’t watch Wood Storks without also getting an eyeful of other waders gathering together for the dawn fishing session. It was all to easy to catch opportunities for inter-species interactions, like the one below consisting of four species of fish-eaters. 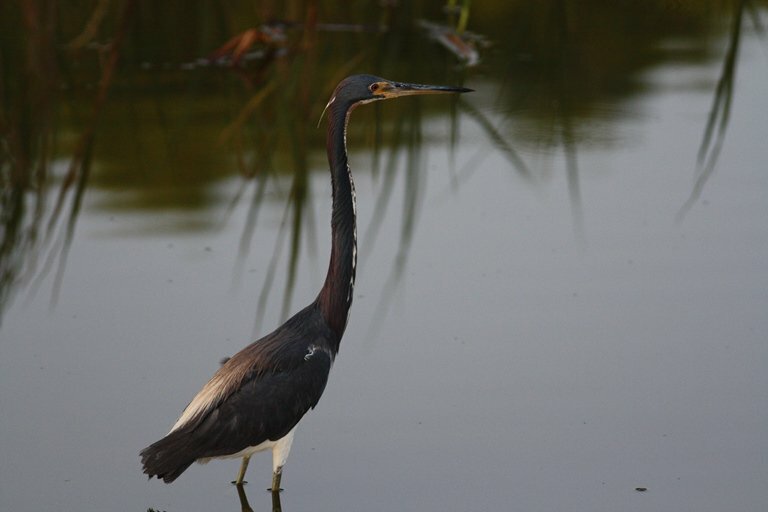 My personal favorite are the Tricolored Herons. Is there a more elegant heron in the entire world? A good look at one of these stunners is enough to make even Great Egrets look like Island of Doctor Moreau-era Marlon Brando. No, this is not Florida, but we have American Alligators in the Carolinas as well. The big pond at Huntington Beach held as many as I’ve ever seen in one place, including at least one impressive eight footer who gave a hungry eye to the egrets and herons lined up on the banks. I can’t imagine alligators are capable of expressing anything but hunger through those vertical reptilian slits though. This one, only about six feet, got close enough to me for the Pleistocene part of my brain to begin pinging uncomfortably. 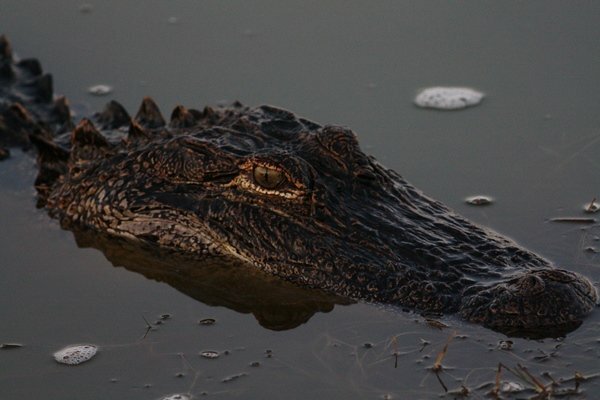 Modern humans may have little to fear from alligators, but deep in our conscious we remember. The final wader count (including storks and ibis) for the morning ended up at twelve species, a pretty impressive total anywhere in the hemisphere. Below is a family shot of at least six. Can you find all of them? You can click on it to get the larger photo. A fairly Floridian morning. All in South Carolina. Gotta love southern birds! Especially that American Alligator there. Data Tampering In Climate Change Research? Not At All!